I read this story yesterday, and it’s too cute not to share. Four years ago a man in Brazil found a penguin covered in oil and starving on a beach. He cleaned him, cared for him, named him (Dindim) and nursed him back to health before releasing him back into the wild. 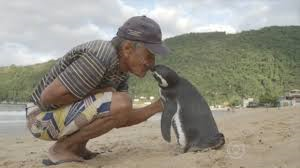 Every year Dindim the penguin travels thousands of miles back to see the retired fisherman who rescued him, and spends 8 months living with him in his house. I think there’s a life lesson in there too. Not to swim thousands of miles cross the sea every year. But to not forget people who have been there for us. To show some love and appreciation. You don’t have to spend 8 months with them. Just a call, text, or visit to let them know you appreciate them. I saw this yesterday too and it stole my heart! I wasn’t sure if it was true, but either way it was a lovely story. If someone else believes it with me then good! I always believe nice stories, simply because they make me feel the world isn’t such a horrible place, and what’s not to like about that? !